Habit: Biennial, perennial herb, <= 10 dm, generally canescent-puberulent, often sparsely glandular. Leaf: generally 3--10 cm, lanceolate to oblanceolate, +- entire to irregularly dentate or serrate; distal clasping. Inflorescence: heads radiate; phyllaries generally in 5--12 series, tips acute to long-acuminate, spreading to reflexed, generally hairy and/or glandular throughout. Ray Flower: many; ray 1--2 cm, blue or purple. Note: One other variety, in southwestern United States. Dieteria asteroides var. lagunensis (D.D. Keck) D.R. Morgan & R.L. Hartm. Leaf: mid-cauline generally 2--5 mm wide, entire or obscurely toothed. Inflorescence: involucre widely obconic to +- hemispheric; phyllary tips 1--3 mm, acute to short-acuminate. Citation for this treatment: David R. Morgan 2012, Dieteria asteroides var. 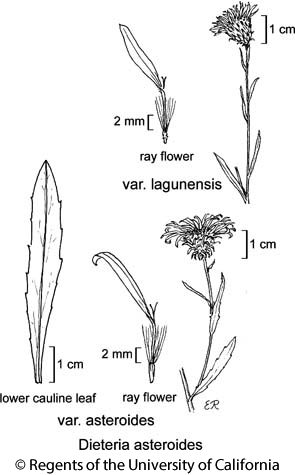 lagunensis, in Jepson Flora Project (eds.) Jepson eFlora, http://ucjeps.berkeley.edu/eflora/eflora_display.php?tid=82112, accessed on April 20, 2019. PR (Laguna Mtns, San Diego Co.); Markers link to CCH specimen records. Yellow markers indicate records that may provide evidence for eFlora range revision or may have georeferencing or identification issues. Purple markers indicate specimens collected from a garden, greenhouse, or other non-wild location.